We at CBS Talks are beyond excited to announce CEO of Microsoft Denmark & Iceland, Marianne Dahl Steensen, as our third speaker of this semester! On the 27thof November, Marianne will visit Copenhagen Business School to do a talk about her journey towards the top of Microsoft as well as the ups and downs along the way. Furthermore, Marianne will provide insights towards her style of leadership as well as talk about whether being a woman in the business environment has ever been a challenge. Marianne Dahl Steensen was appointed as the CEO of Microsoft Denmark & Iceland in July 2015 at the age of 40. When Marianne Started in Microsoft, the IT business was relatively new to her since she came from a career, which centred around transformation and change management with leading positions at Codan insurance and TDC. Marianne was appointed CEO of Microsoft to lead the transformation of the Danish and Icelandic subsidiary companies from a business and cultural perspective. Besides being the CEO of Microsoft Denmark & Iceland, Marianne is also a board member in DFDS, part of the executive committee at Dansk Industri as well as being a member of the Disruption Council, which was set up by the government in may 2017. Furthermore, Marianne act as a mentor for entrepreneurs, start-ups and new talents as well as doing speeches and taking part in discussions regarding tech and leadership in various Danish medias. CBS Talks are looking forward to welcoming you to the second inspiring talk of this semester! The CEO of Ambu - Lars Marcher! Ambu is a Danish worldwide company that develops, manufactures and markets medical equipment, and for the past ten years Lars Marcher has been the global company's’ CEO. He has more than 30 years of international business experience, and has led three listed companies and built solid experience in strengthening companies safely, through both times of crisis and growth. Lars graduated with an MBA from Macquarie University in Australia in ´95, and has since then worked in Purup Electronics, Apple Computer, Memory Card Technology and Terma A/S, among others. On the 3rd of October, Lars Marcher will talk about his passion of creating clear directions and ambitious goals, and how to develop the best setup for engaging, motivating and energetic employees. We are super excited for Lars’ Talk, and nonetheless to see all of you! CBS Talks are looking forward to welcome you to this semester’s first Talk with Thomas Hofman-Bang, CEO of our partner KPMG. In 2014 KPMG was re-established in the Danish market. The CEO of KPMG, Thomas Hofman-Bang, will share with you how he managed to reposition KPMG as one of the The Big 4 accounting firms in Denmark. Thomas Hofman-Bang has been CEO and Senior Partner at KPMG since February 2014. He has a background in public accounting and more than 30 years of experience as senior executive (CEO, CFO, CoB, Non-Executive Director, auditor, and corporate advisor) in various global companies. At KPMG, Thomas Hofman-Bang is managing one of the world’s strongest business-to-business brands. His extensive experience is leveraged on a daily basis, as both buyer and provider of professional services. KPMG is established as a client-centric organization, being lean and highly skilled in delivering value to clients so they can grasp opportunities and mitigate risks. Thomas Hofman-Bang is very passionate about leadership and is shaping an engaging corporate culture at KPMG with cross-functional collaboration, a pioneering spirit, and innovation as drivers for delivery of quality, integrity, and service. At this talk, Thomas Hofman-Bang will reveal more about the journey KPMG is on – as will he share the story about his personal journey from auditor to CEO in a Big 4 company. At the event he will bring along a group of Trusted Talents from KPMG who will talk about some of the exciting projects they are currently working on. The last talk of this semester is with the Minister for Foreign Affairs and Trade of Hungary, Péter Szijjártó. The Hungarian Minister of Foreign Affairs and Trade, Péter Szijjártó, will share his view on the current European challenges and the future of the European Union. The present situation in the European Union is dominated by the highly debated refugee crisis. Hungary presents no exception and in this Talk Péter Szijjártó will share his view on the the crisis and describe how he perceives its impact on the EU. Consequently the title of the Talk is: The Future of the EU. Péter Szijjártó has previously argued that the EU is dealing - not with a refugee crisis - but a mass migration. He expects that as many as 45 million people in the Middle East and North Africa could soon start making their way to Europe due to the political situations and conflicts in their home countries. Further, the minister has remarked that European politicians should refrain from making comments that could be interpreted as invitations by people in unstable regions. Hear more about Minister Péter Szijjártó’s view on the refugee crisis and mass migration at our Talk on May 31st. The minister began his political career in 1998, when he was elected as the youngest member of the Municipal Assembly of Győr. Since September 2014, he has occupied his current entitlement. Péter Szijjártó is an educated economist who earned his degree in International Relations from the Budapest University of Economic Sciences and Public Administration. We look very much forward to welcome you to our talk with Steffen Kragh, the CEO of Egmont! Steffen Kragh is the CEO of Denmark’s leading and largest media group, Egmont. At his talk he will share insights to Egmont’s transformation of its businesses – e.g. Nordisk Film, TV 2 Norway and 700 magazines across thirty countries, and digital platforms - in a world of exponential change. The rise of the digital technologies has impacted the consumption of advertising, cinema, games, music, television, and video. Media companies - both hardware and content developers - have had to alter how they reach and retain customers. Understanding and analyzing competition is vital for achieving success in today’s dynamic media landscape. On behalf of this, the topic of the talk will be: A disruptive world. Furthermore, Steffen Kragh will share his view on leadership in a company that is build on creativity, technology and entrepreneurship. The talk will take place in the Falkoner movie theatre owned by Egmont near Solbjerg Plads. Participants will be offered free soft drinks and popcorn when arriving, to enjoy during the talk. After the event, CBS Talks will welcome you to a networking session at the lobby area in the cinema where cold beer and soft drinks will be served. Multiple representing employees from Egmont Media will be looking forward to networking with you here. Here among is Vice President of Corporate Communications & Public Affairs, Line Aarsland, and Vice President of Corporate HR, Anne-Christine Ahrenkiel. Date for registration will be announced soon. CBS Talks is looking forward to welcome you back from the holiday, and present our first speaker this semester. We are proud to present Lone Fønss Schrøder, who will talk about leadership of today. She is currently chairman of Saxo Bank and is a board member at IKEA, Volvo, and Schneider Electric among others. She has extensive experience from A.P. Møller Mærsk, where she worked for several years and was Senior Vice President until 2004. Lone Fønss Schrøder will share her view on the organization of the future. Digital strategies are increasingly dominating the business agenda, and these offer new business models. The digital transformation will create new opportunities and challenges for today's corporations. These opportunities include various digital tools such as Big Data, sky/cloud, Internet of things, and robot technologies. Lone Fønss Schroeder is going to talk about how companies can utilize these digital tools to make themselves competitive in the long term. Join us for an interesting evening with PwC and get the chance to network with Partners, recruiting officers and other people from PwC. CBS Talks together with PwC Denmark invites you to an evening with focus on leadership. How do you lead yourself, and what will it take to lead others? You will gain an insight into life as a PwC leader at all levels. Because at PwC, everybody will lead at some point, but you will have to start out by leading yourself. You will participate in three workshops concerning the different working areas of PwC. Your leadership dilemmas will be debated by partners from the company. Furthermore you will get a unique opportunity of networking with employees from all over the organisation. Who: All students can apply, not just from CBS. How: (1)Send CV, (2)grade transcript and (3)maximum half a page application about a leadership dilemma. REMEMBER it is not all about grades - we are also looking for interesting people who show dedication in their field of interest! We are proud to present Christian Clausen, Senior Advisor and former CEO and President of Nordea. The banking industry is going through the biggest transformation in history. To set direction and navigate successfully through this period of uncertainty and fast paced change, Nordea has this year launched a new strategy founded on a customer vision. To implement the vision, the bank needs to fundamentally change its operating model in creating a fully digital platform. However, what is needed for Nordea to succeed in this transformation? And what role has values, vision and leadership played in Nordea’s rise as one of Europe’s best performing banks. On 12 November Christian Clausen, Senior Advisor and former CEO and President of Nordea, will share his thoughts the transformation of banking as well as on career development. Christian Clausen was the CEO and President of Nordea until the end of October. We are proud to announce that CEO of Danfoss, Niels B. Christiansen will join us for a Talk where he will talk about strategy and leadership. The official registration will open on October 28. Niels Lunde from Børsen will be interviewing Niels B. Christiansen at the Talk. The efforts of Danfoss CEO Niels B. Christiansen on the Core & Clear strategy are known worldwide as a great example of how to create value in a modern industrial company. For the past five years Danfoss has achieved more value creation than huge competitors such as Siemens, ABB and Emerson Electric. A new book by the Editor in Chief at Børsen, Niels Lunde, gives a unique look behind the scenes of Danfoss’ achievement. Det ny Danfoss (The New Danfoss) is the story of how a modern chief executive develops a strategy and then successfully implements it – in an international company employing 23,000. You can meet Niels B. Christiansen and Niels Lunde (4 November 2015, 16:45, at SP210). Niels B. Christiansen will talk about Core & Clear and answer elaborating questions from Niels Lunde, who will also talk about his work with the book. - 1991-1995: Consultant at McKinsey & Co. The official registration opens on October 13 on Ublend. 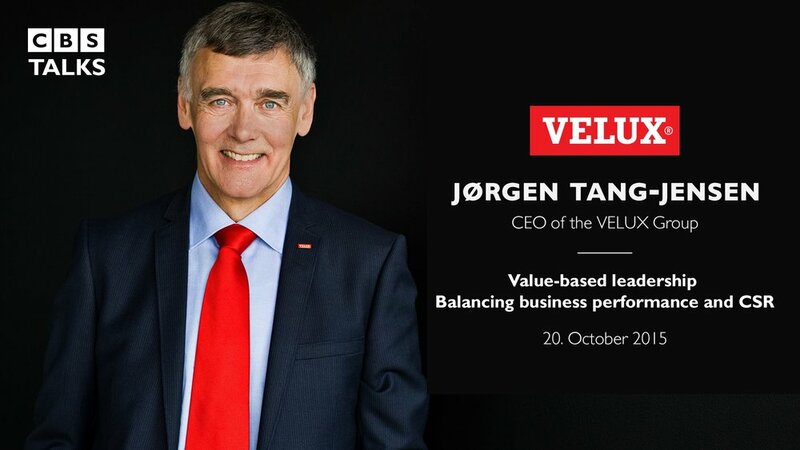 We are proud to present our first talk of the semester with CEO of VELUX Group, Jørgen Tang-Jensen. Access to daylight and fresh air is a vital part of Jørgen Tang-Jensen’s DNA as he has been with the VELUX Group for more than 25 years. He is educated Cand.Merc. and has taken an MBA at Aarhus Business School and came to the VELUX Group in 1981. By taking up leading positions in several European sales companies he attained a thorough understanding of the business, the challenges and the opportunities. At IMD, Switzerland and Stanford University, California, he refined this insight and in 2001 he became CEO of the VELUX Group succeeding the founder’s son Lars Kann-Rasmussen. The VELUX Group is the world leading manufacturer of roof windows. The Company works globally – with sales and manufacturing operations in more than 40 countries and around 10,000 employees world-wide. The VELUX Group is owned by VKR Holding, a limited company wholly owned by foundations and family. We are extremely proud to announce our last Talk of this semester with Group CEO of Maersk Group, Nils Smedegaard Andersen. The official registration will open on June 3. An economist by education, Nils S. Andersen has been CEO of the Maersk Group since 2007. He has focused on international growth and increased competitiveness, and has simplified governance so that business units are fully accountable for their performance. The overall aim is to grow profitably and further stabilise the Group’s earnings. Under Nils S. Andersen’s leadership, the Group has built five world-class, stand-alone business units within shipping and energy. The Group now has a more focused portfolio and leaner organisation, and it has increased its transparency and communication with stakeholders. He travels widely to meet customers and share his views on trade and infrastructure and how this can lay the foundations for growth across the world, spending much of his time in growth markets which require modern ports and transportation links to continue their development. Nils S. Andersen is particularly concerned with the safety and motivation of employees and meets regularly with them in offices around the world. Nils S. Andersen, who is also Chairman of the Dansk Supermarked Group and a member of the board of fashion retailer Inditex, started his career as a controller with Nordic Sugar in 1982. He soon switched to the Carlsberg brewery group, where he held a number of market focused positions before becoming the Executive Vice President and later CEO. In this role, he led a number of acquisitions and market entries and headed a number of other group-wide initiatives. We are proud to announce that Lars Tvede will fly in from Switzerland to present a Talk at CBS. We are proud to announce our first Talk of 2015 with the CEO of Nykredit Michael Rasmussen! The event will take place at Porcelænshaven, and Nykredit will be at the networking event to answer all questions that you might have. The registration will open on the 4th of March! Michael Rasmussen talks about his leadership journey as head of Nykredit – the largest lender in Denmark, and one of the largest private bond issuers in Europe. Since Michael Rasmussen joined Nykredit in September 2013, neither he nor the company has stopped moving forward. His ambitions are high and the changes profound. Michael Rasmussen will give an honest talk about his personal leadership journey; about the importance of strategy and leadership values, and not least about the journey to reposition the Nykredit Group to the changed market conditions. Michael Rasmussen (1964), Group Chief Executive of Nykredit since September 2013. Michael Rasmussen started his career in finance in 1986 when he joined Nordea's Treasury area. In 1990, he graduated as MSc in Economics from the University of Copenhagen. He then worked his way to become a top executive of Nordea. In 2000, he was appointed member of the Executive Management of Nordea Bank Denmark. In 2008, he became a member of the Group Executive Management of Nordea, and in 2011 he could add Country Senior Executive of Nordea Denmark and Head of Retail Banking to his CV. In September 2013, he joined Nykredit as Group Chief Executive. At the same time, he became chair of the Association of Danish Mortgage Banks. Nykredit is a customer-driven financial mutual, founded by its customers and existing for its customers. That has been the case for more than 150 years. But, as Michael Rasmussen points out, "sometimes you need to change to stay the same". Since his very first day in charge of Nykredit, Michael Rasmussen has set an agenda of profound change: "We have embarked on a long journey that calls for courage. We must aspire every day because our customers, the Danish homeowners, deserve a company that constantly improves and truly takes care of them, their families and their finances". Michael Rasmussen has named Nykredit's strategy "Winning the Double", and the sports reference is not a coincidence. Michael Rasmussen loves football, tennis, running and cycling. Furthermore, he prioritises spending time with his family, his wife Kamilla, and their two children, Emilia (2004) and Selma (2008). We are proud to present our last event this semester with Jørgen Buhl Rasmussen, Group CEO of Carlsberg. The official external registration will open on the 3rd of December. The link will be posted here. Jørgen Buhl Rasmussen graduated from CBS with a bachelor’s degree in Economics and Business Administrations in 1977 followed by a MBA study in 1979. He is highly energetic and has a strong background in marketing from positions as marketing manager in Master Foods and Duracell before taking on positions as General Manager in Duracell and later as Area Director responsible for Duracell’s northern European activities. Jørgen Buhl Rasmussen went on to join Gilette Group, first as president of Duracell Northern Europe from 1997 to 1999 and later as president of Gilette Group AMEE (Africa, Middle East, Eastern Europe). In 2007 he was pronounced chief executive officer at Carlsberg, where he became a part of the £7,8bn takeover of Scottish & Newcastle. This takeover gave Carlsberg complete ownership of Russia’s largest beer brand, Baltika, and provided a big learning curve and invaluable experience for Rasmussen. In 2011 a huge strategic change took place in Carlsberg in order to perform a global repositioning. The original slogan “Probably the best beer in the world”, that had been in place since the 1980s was replaced by the new slogan “That calls for a Carlsberg”. This new slogan was rolled out across 140 markets with a hope of boosting the sales in Asia. We at CBS Talks invite you to our last event this spring with Lars Rebien Sørensen, who is the CEO at Novo Nordisk. Our mission is to bring the best leaders from all industries to CBS. So far we've had the entrepreneur and bank CEO in Saxo Bank, Lars Seier Christensen. We've had the one of the best marketing directors in the world, Morten Albæk, CMO in Vestas. And last but not least we've had Henrik Andersen COO in Denmarks biggest company, ISS. The 14th of May for our last event this spring we bring you, nominated by Harvard Business Review, the 20th best performing CEO in the whole world, Lars Rebien Sørensen. Mr Sørensen is a member of the board of Thermo Fisher Scientific Inc., US, and a member of the Supervisory Board of Bertelsmann AG, Germany. Mr Sørensen has an MSc in Forestry from the Royal Veterinary and Agricultural University, Denmark (now the Faculty of Science of the University of Copenhagen) from 1981 and a BSc in International Economics from the Copenhagen Business School from 1983. Mr Sørensen received the French award Chevalier de l'Ordre National de la Légion d'Honneur in 2005. In October 2007, Mr Sørensen became an adjunct professor at the Faculty of Life Sciences of the University of Copenhagen. The event will be about Marketing and Leadership. Morten Albæk will talk about being a leader in a multinational company in the wind industry, and furthermore of managing a marketing team. Henrik Andersen will talk about being a leader in Denmark’s biggest company. How do you manage to have a company full of more than half a million motivated employees? CBS Talks welcomes you to our first event with Lars Seier Christensen, CEO, Saxo Bank. The 13th of March, Lars Seier Christensen visits CBS Talks at Copenhagen Business School. Lars Seier Christensen is the CEO of the online investment bank, Saxo Bank. The company, that was started 22 years ago in a small apartment in Copenhagen (originally named Midas), is today the world’s 11th largest in the market for currency trading. More than 150 banks and financial institutions as well as over 100.000 private investors use Saxo Bank's electronic trading platform with more than 30.000 different financial products. The company has grown into a size of 1300 employees with 26 offices worldwide. At the event we want to provide insight of how Lars Seier Christensen has managed to create success like this. How does he motivate his staff to perform their best every day? How does he motivate him self? What is characteristic about him as a leader? etc. Once again, become a part of this awesome event that will provide you insight about the aspects of leadership in the private business community.